Yea for the Almost Kiss Winner! 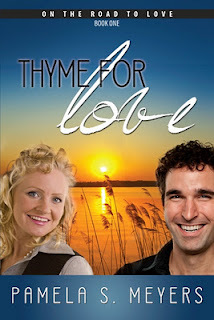 A Thyme for Love by Pamela S. Meyers! He brought his mouth closer, and the tiny elevator started to spin. Then everything went black. If you missed it, drop by Clash of the Titles to take a peek at One Breathless Moment…We received positive reader response for this spunky romance.“Great tension! I was riveted to every word!”“Love the anticipation and butterflies in the almost kiss scene…”“The setting was marvelous, the tension leaped off the pages.”A Thyme for Love is a wonderful example of the awesome Christian fiction available. This week, an exciting new Unpublished Novel Clash begins. It’s hosted by our very own April Gardner! Make sure you come by for another chance to vote and WIN a free book! Categories: News | Tags: COTT, romance | Permalink. Marji is a recently "graduated" homeschooling mom whose twin girls have blessed her by sticking around the nest for a little longer. She spends her days directing the children’s music program at her church and working with the authors of Write Integrity Press to put out the best possible version of their books. Raised in suburban Dallas, she got her first taste of writing through the stories of brilliant authors of their day, Mignon Eberhart and Phyllis A. Whitney, and through stage experience. After directing and acting in productions for decades, Marji started writing her own scripts. From that early beginning, she delved into creating scintillating suspense with a side of Texas sassy. She invites readers to unravel their inspiration, seeking a deeper knowledge of the Lord’s Great Mystery that invites us all. COUNTER POINT Free 1/16/18 Only! With all the secrets revealed, Dani must fight for her own survival. Meeting the family can be... well... murder! Secrets and ghosts from Dani's past threaten more than her future with Jay, they put both of their lives in jeopardy. Finding a dead guy is unnerving for anyone, even someone with Dani's gruesome job! Crime scene cleaning is a perfect job for neat-nick Dani Foster. But when her friend goes missing, she finds herself scouring through more than dirt! Sign up for the monthly Faith Driven Fiction newsletter. My email crew also gets free books from time to time and early news! On Suspense with award-winning author Elizabeth Noyes!